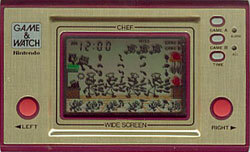 One chef has to cook several meals at once. Keep flipping the food into the air, but don't be tricked by the hungry cat. Move the chef left and right to catch the food before it falls onto the floor. The food is flipped into the air at different heights. You score 1 point for every piece of food you catch. The Cat-Thief will sometimes appear on the right side of the screen and catch food to confuse you. If you drop any food then the Rat-Thief will steal it and you get a miss. Get three misses and the game ends. Flip three pieces of food in the air. Flip four pieces of food in the air.